Norbert Lelles is a Breton trader and the proprietor of Lelles' Quality Merchandise on the dockside of Anvil. This advantageous location amongst the many sea traders results in him being able to offer several goods that would normally be hard to find, even in the Imperial City. He sells weapons, clothes, potions, foods and books and will buy almost everything, as long as it’s not stolen. Recently, his shop has been plagued by a series of nightly break-ins, and he has requested help from Azzan of the Fighters Guild–who passes the request to you. The misspelled sign in front of his shop has been a conversation topic in Anvil for years, and it’s common knowledge that Norbert runs a fine establishment, even though he is a bit simple-minded. All that doesn’t bother Norbert at all, and he keeps himself busy running the shop and tending his relationships with the seamen on the dockside. He sleeps in one of the two beds above his shop every night between 10pm and 6am and starts off the day wandering around on the ground floor until he unlocks the door at 8am. For the next twelve hours he will offer his services to customers until closing time at 8pm. After a long days work, he finishes his day next door at The Flowing Bowl where he eats dinner and talks with the numerous pirates, traders and captains until he heads home to bed at 10pm. The exception to this routine happens during the related quests stage 20, when he will leave the shop and stay at The Flowing Bowl, without eating or sleeping, eagerly awaiting news from you. He wears a pair of doeskin shoes, a quilted doublet and tan linens. He carries around his shop key and a leveled amount of gold. 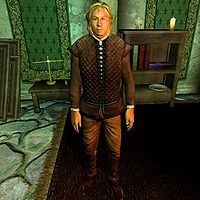 Well aware that his shop has one of the best selections in Cyrodiil, he will introduce himself with the following: "I'm Norbert Lelles. I let my merchandise speak for itself. Look around. If you see something you like, we'll talk about a price." When asked about his city of choice, he will reveal the secret of his success: "Anvil's a port town. That's why you'll see items here you won't find in the Imperial City. The captains keep an eye out for special items for me." When you arrive with the contract in hand, he will give you a different greeting and explain a bit about the infamous sign: "Greetings! Welcome to Lelles' Quality Merchandise. We have a wide range of goods to suit your needs. Oh, and perhaps you saw the sign outside. Slight mistake, you know. Bit of bad luck there. So, what can I do for you?" Asking him about Norbert Lelles while his related quest is active will have him confirm his identity "I am Norbert Lelles. How may I help you?" About the string of robberies towards his shop, he will give the following explanation: "I've lost a great deal of merchandise over the last few months. I keep replacing it, but they keep stealing it, new locks on the doors be damned! They always come at night, after I've gone to bed. Maybe a mage transports them inside! You can just stay in the shop overnight. Good luck! I'm going to wait at the Flowing Bowl until this mess is settled. I know I can trust you to keep the place safe." Asking him again will have him reply "As I said, I'll need you to stop these thieves from breaking into my store. It only seems to happen at night." After dealing with the burglars and telling him their true identities, he will be surprised: "You've gotten them? Wonderful! But... their names are familiar to me. All of those men have worked for me! Amazing. I even trusted them to open up the shop in the mornings. I can't imagine what turned them to a life of crime. Sad. Well, here's your payment." After that, he will always greet you with: "Greetings! Seeing you just makes me feel safer!" The citizens of Anvil are aware of Norberts shortcomings and will tell you that "Norbert Lelles runs a fine store, but he’s not the brightest fellow. ", "I feel sorry for Norbert Lelles. He’s a good man, but he gets taken in so easily. ", "He's a nice fellow, but he couldn't even get the sign for his store spelled right. ", and "He's not the smartest man, but he's a nice guy. I just hope he can keep his business afloat." During the quest, they will point you in the right direction and once again make fun of the sign: "He runs Lelles' Quality "Mercandise." Ha! Not a bad sort. You can usually find him in his store." According to Grommok gro-Barak's Journal, Norbert has been robbed before, as adventurer Lewin Tilwald once lifted a 'strongbox of money' from his shop. Esta página foi modificada pela última vez à(s) 02h30min de 25 de outubro de 2013.